From the Editor of Reverse Spins: To me the following excerpt from Unveiled Mysteries is the most thrilling in all of the vast library of metaphysical and esoteric teachings. It speaks to the soul at so many levelsthe need to be ready as the bride for Christ's unexpected appearance; the phenomenal story of two individuals being in the right place, at the right time, in the right vibration; one man's implied but glossed over travails throughout his life yet he was always focused on the goal and the Divine connection. It is without a doubt the most exciting tale of one man's ascension ever told. Well, maybe the second greatest story. The story is found at the end of the book. Guy Ballard has recently received a test of overcoming fear. Saint Germain looked on from etheric realms as he allowed a panther to cross Guy Ballard's path. Mr. Ballard conquered his fears and made friends with the panther. It was a bond that would soon pay dividends. Several days later, as he was walking along a mountain trail with his new feline friend, a large mountain lion sprang at Mr. Ballard from a cliff fifteen feet above. He jumped out of the way just in time. The smaller panther instantly sprang to his defense. After a terrible fight, the lion was defeated but the panther suffered mortal wounds as well and died at Mr. Ballard's feet. Saint Germain then appeared and consoled his grief stricken student. He explained that the panther's consciouness was elevated by his association with Guy Ballard and that the panther could no longer stay in that limiting body. He had gladly sacrificed his life for his human friend (he died with a contented smile on his face) and now he was free to move on in spiritual evolution. Mr. Ballard had proved time and again that he could be counted on to be harmonious in many situations. By stilling his feeling world, more light was able to pass through him. He was now ready for a most important test. Could he be a true vehicle for the Light that could transform others? 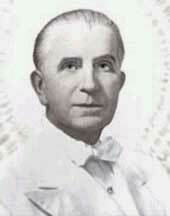 Was he ready to be the first Messenger for the Great White Brotherhood in the twentieth century? After a lifetime of searching, David Lloyd was ready to give him that chance. On the morning of the seventh day, I [Guy Ballard] left my lodge at four o'clock and reached our meeting place at ten-thirty [He had met Saint Germain there before]. 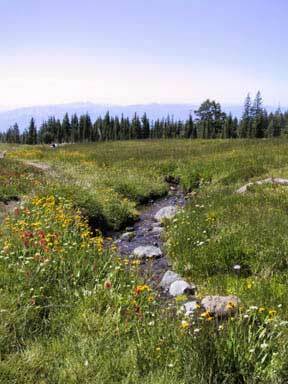 I sat down on a log to wait with a feeling of wonderful exhiliration, which I knew to be the result of my meditation. I was so deep within the contemplation of my God Self, I did not hear anyone approaching until a voice spoke to me. "My friend, I would like to tell you a story. It won't take long. I haven't told anyone for a long time. I would like to try once more." "It is he! It is he!" "My father was a British officer stationed in the Punjab of India where we made our home. When I was sixteen, he financed a friend who went to South Africa to try his luck in the diamond mines, but my father never heard from him afterward. "The year I was twenty, a tall, handsome stranger, a man of great wisdom, visited my father at our home. He had come to bring a message from father's friend. "'I cannot leave India at the present time,' my father replied, 'for I am on government duty here. I appreciate greatly your offer to take care of the matter for me.' I was standing near-by during their conversation, and when they had completed arrangements, the stranger turned to me. "The stranger left, and a month later my father, who had ridden out to adjust certain government matters with the natives was shot, and passed on before he could be brought home. I was an only son, and after another month, mother and I prepared for our return to England. Just before we left, the same stranger came again, and said, he was ready to transfer father's fortune to me. I explained father had been shot. "I can never repeat the disappointments, the trials, the sorrow I have been through but in the face of everything, somehow I could never give up. The thing which seems so strange to me is, while I have grown old in outer appearence, my energy and strength are as great as ever, sometimes I think greater, than in my fullest youth. "In years, I am seventy. Today, I just wanted to follow this trail, and praise God I have found you. My desire was so great, it was almost irresistible." "But my good man," I asked, "what am I to do for you?" "You will know," he replied, "for I know I have made no mistake. In the heart of this majestic mountain is a Great Power. I feel it. Ask God to show you what to do." "Mighty God in man and the Universe! We seek Thy Light! We seek Thy Wisdom! We seek Thy Power! Let Thy Will be done in and for this, My Brother, who has sought and found me to do for him I know not what. Thou knowest! Manifest Thy Will through my mind and body, and let whatever is to be done for the BrotherThy Soncome forth." As my hand came down, it held the Crystal Cup filled with "Living Liquid-Light." I offered it to him, and my Mighty God Self spoke again. "Drink without fear. Thy search is ended." "Behold! Thou art forever free from all earthly limitation. Ascend now unto the Great Host of Light' who await Thee." "I shall return to thee, Beloved Brother. Well shalt thou be repaid for this Transcendent Service. Thou wert the only one through whom this could be done for me. Some day, thou shalt see why," and with a happy smile, he disappeared on a Radiant Pathway of "Light." As the Mighty God-Power Within me receded, I was so astounded, I fell on my knees and offered the deepest prayer of my Life in grateful humility and praise for the privilege of giving such service. 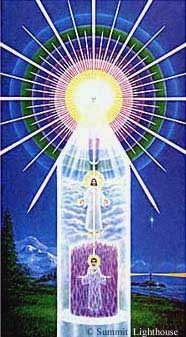 I rose and the Master Saint Germain received me into his wondrous embrace. "My Beloved Brother!" he said, "I am greatly pleased. Noble and faithful was your attendance upon the Great God Within you. Beautifully did you receive your Mighty 'God in Action.' I do indeed congratulate you. You will ever be held within Our Embrace, even though outwardly you may not always be aware of it. "You have become a worthy 'Messenger' of the Great White Brotherhood and the Ascended Host. Hold close to your Mighty God Self. Thus, you will ever be ready for service wherever and for whatever is required. My Love enfolds you until we meet again. I will keep you informed." Slowly, I wended my way back to the lodge, every step praise and gratitude to the "One Mighty God" that molds us all into "Eternal Perfection." end of Chapter ten. Editor: This is not the end of the story. David Lloyd was afforded the opportunity to deliver many dictations to the student body of the I AM Movement. Here is what he had to say from Etheric octaves in his first dictations after his Ascension. The first ones were given in 1937 and are found in The "I AM" Discourses Vol. Ten . Beloved Students of America, the culmination of the ages is at hand! I was in the physical body similar to yours, searching, searching, searching as you are, as many of you have been, possibly for a longer period than I searched; and yet, as the Victory came to Me, so shall It come to you. If you could imaginetry just for a few momentsMy position in having been told in India when I was there with My father, who was on government business, that on a great mountain in North America I would find a Man with a Crystal Cup who would assist Me to the Ascension. Imagine, one starting out to find this place in a great country like America, where there are great ranges of mountains. Think of itand then to find that mountain, not even knowing the State it was in. ... If you can imagine those years, when searching month after month went on with no results, and time and again I would think it was no use; but always no sooner would that human feeling think it no usefrom within Me would arise that strong Power that so far transcended the human feeling that said there was no use, that I would go on again. Believe it or not, Dear Ones, in all those years, that energy and strength within Me increased, and as I think of it today, it was a marvelous thing. 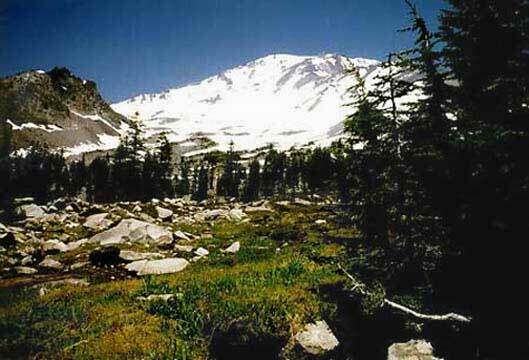 Then that day when I was directed to Mount Shasta, just by My feeling, not in any other way, and when this good Brother had come out, as He thought, to meet Saint Germain, and was sitting there on a log waiting for Him, I came up to Him. He turned and saw Me ( I am making this very brief). When He offered Me a drink of water and offered Me the cup, in His hand came the Crystal Cupthe first precipitation He had had Himself. When I saw That Cup in His handafter all those many years of searchingcan you imagine just for a moment the Feeling that took possession of Me, when the Master had said: "When you find that Man with the Crystal Cup, you will have found the One who will assist you to make the Ascension!" Notice! All this gathered momentum of expectation all through those years, suddenly released and rushed forward like a mighty avalanche. When I explained to this good Brother what had taken place, He said, "What am I supposed to do?" Then that Power surged in Me again and I said to Him: "Ask the God in you who does know!" And with that, His whole human self just dissolved out of the way and the Light from His "Mighty I AM Presence" came down, until His arms were blazing Light and His hands reached out and took Mine, and in a few moments My feet left the Earth. Then as I continued until My feet were fifteen or twenty feet above His head; then I realized My Glory was at hand! Can you for a moment feel the Victory, the Power, the Strength, the Courage which were Mine in that Great Achievement? [There is a great deal of radiation during a dictation that the audience would be feeling at that moment.] Then as I stood there in the upper air, looking down at Him, such Gratitude filling My Heart, I suddenly became aware that all age and its appearence had left My Body. Then the ordinary suit of clothes I was wearing dissolved into those garments of the Higher Octave, and instead of a man of the world, a physical being, I stood there clothed in Garments of Dazzling Light, a youth of twenty summers! Then the Great Ray of Light from the "Presence" descended, and from this good Brother I disappeared into that Ray of Light; but not as He thought, for to Him I disappeared, but to Me I saw through that Light and still was aware of His presence, even when I was absorbed into the Electronic Body of My own "Mighty I AM Presence." Now at this point I want to explain to you what actually takes place and the difference between the "Presence" as you see It indicated there on the Chart of an unascended being, and that which actually took place in My own experience in the Achievement of the Ascension. The "Mighty I AM Presence" as It stands there with the unascended being, knows nothing about your limitations and distress down here in the physical world. Now notice this; but your Higher Mental Body does know bothknows the Perfection above It and the imperfection and your struggles down here, and waits and waits and waits for you to begin to give attention to your "Presence," so that It can release the Intelligence and the Energy you require into your world of action, to produce the results you require. 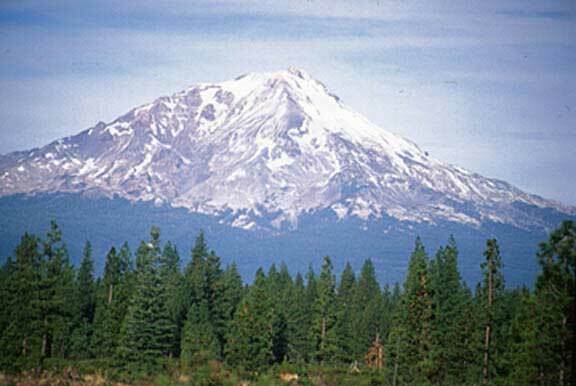 ... Now Dear Hearts, there are those in the World who have thought that This Experience of the Ascension upon Mount Shasta was a figment of His imagination. Let Me tell you, it was MIGHTY, REAL, and I was there in the physical body like yours. Then the Great Law of His Presence was released, until these arms were a blazing Light you could not look into, and He took My Hands. As I ascended and let go of His hands which grasped Mine, then as My feet were perhaps fifteen feet above His head, that Transformation from the human into the Divine took place within My body. ... Today, owing to the Great Cosmic Light coming forth, Beloved Ones, and this Beloved Saint Germain, it has made it possible for mankind to have this Transcendent, simple Understanding of the :Mighty I AM Presence," which even children can apply and receive results. Then you, Precious Ones, will you not take hold of This Understanding of the "Mighty I AM Presence"? Do not look for results, but call the "Mighty I AM Presence" forth into action until every vestige of your human limitations is dissolved and consumed, and you are se Free. Editor: David Lloyd did indeed repay the debt to Guy Ballard. Prophets and Messengers always suffer the calumny of the world. The negative energies of hatred, jealousy, criticism, and judgement are continually sent their way by those who have failed tests on the path and find it easier to blame others. In addition, those who have aligned themselves with darkness over the centuries will always have antipathy toward the Messengers of the Great White Brotherhood. David Lloyd soon discovered the phenomena. Once he ascended and saw this at astral levels, he vowed that he would always defend Guy Ballard and his wife Edna from attacks upon their character and protect their spiritual, mental, emotional and physical well being. He also pointed out in almost every dictation the importance of giving violet flame decrees and mantras. Saint Germain released this information and dispensation for the Aquarian Age so that people could balance and transmute their karma and make their Ascension. It was a topic close to David Lloyd's heart since his story and life was physical proof of the Ascension.